Hey AJVD fans!! Rosemary here on the blog today to share a card I made using some yummy new AJVD products. 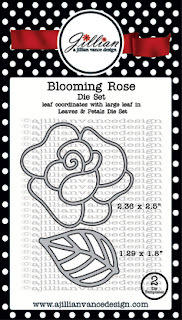 Today's card uses the Blooming Rose die set and the stamp set Simply Said: Thinking of You. I die cut the rose from two different papers (one a solid and the other patterned). I used the solid for the outline and the patterned for the interior. In order to inlay the patterned portions I placed washi tape on the back of the outline and then added in the pieces. The leaves were cut and the pieces removed. Some paper from the same patterned paper pad (My Mind's Eye On Trend) was used for the strips on the bottom, as well as the banner. The sentiment is from the new Simply Said: Thinking of You set. 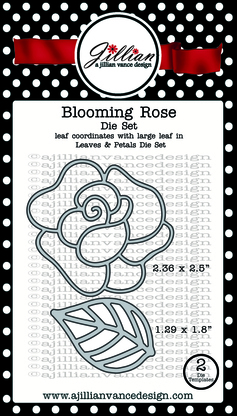 I have an idea for the Blooming Rose die that I'm going to try out soon and hopefully share here on the blog. Oh my goodness, Rosemary! This is over the top gorgeous--my favorite card!! I don't need pp, but if I see that pad I will get it anyway! You never cease to amaze me! WOW, Rosemary, this is simply beautiful! Love how you used the pretty paper & gold dots. You sure made that Blooming Rose die shine! I like the pretty rose die and the pretty papers you used on it!! The little bits of gold on this card make it extra special. Fabulous Rosemary!! What a beautiful card! Love that inlaid rose and the touches of floral paper and glimmery gold! Gorgeous card, Rosemary! I love the pretty pattern papers you chose for the blooms and your color combo is just beautiful! Oh this is so gorgeous Rosi. I love your paper piecing of the rose and how you placed the leaves. Beatuiful. I did not look to see your project and ended up making a rose project today too.